My experience building interactive, real-time systems was put to good use for two of the most complex evacuation projects. One was an automated plug-in to an interactive training system that functioned like a multi-player video game. The actions of different "players" were coordinated using the HLA (High Level Architecture) protocol. Buildings would be evacuated in response to threats and the plug-in would manage the movement of large numbers of people out of a building or area without intervention from the players. The plug-in was initialized by sending a custom TCP/IP message containing the location of files describing the buildings or areas to be evacuated and the initial count and location of evacuees. 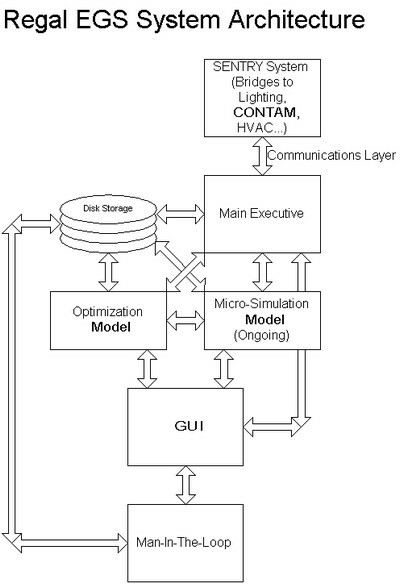 Another project, on which I served as co-PM for our company's part of a multi-company team, was to build an integrated system that sensed certain kinds of threats, managed the internal space to mitigate the threat, predicted the evolution of the threat (and its mitigation) using a fluid model, and illuminated guidance lighting that instructed building occupants how to get out of the building with minimum exposure to the threat. 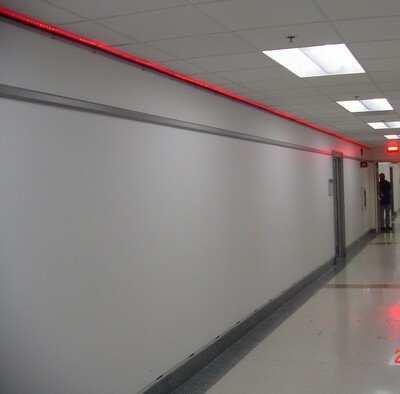 Doors to stairwells and exits and sections of corridor would be lighted green to indicate the safest path (lights would chase along corridors to indicate direction) and would be lighted red to indicate danger and routes that should not be taken. My company's part of the system was to determine an optimized series of routings out of the building that considered the evolution of the threat, the initial distribution of build occupants, and the geometry of the building. 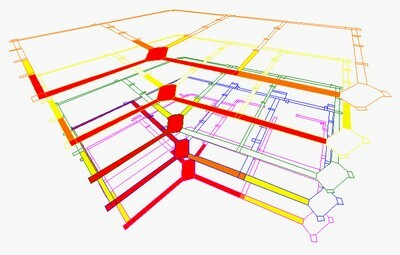 It would then simulate the movement of the occupants according to the optimized routing solution and send the lighting solution to the lighting system. The process was real-time in the sense that it did the sensing, prediction, optimization, and control as an event happened, and gave users a way to enter update threat and movement information (and generate a new solution) based on information received during the event. The image at the top of this page is a still from a user-controllable 3D animation I wrote in C++ to display threat information during the event. The image directly above shows a sample of the installed corridor lighting. The system involved accurate communication of huge volumes of data and the correct application of threat information to mapped regions of the building.